Pumpkin Soup is one of the most common, most basic soups that is made at home. Apart from Tomato Soup and Potato Soup. 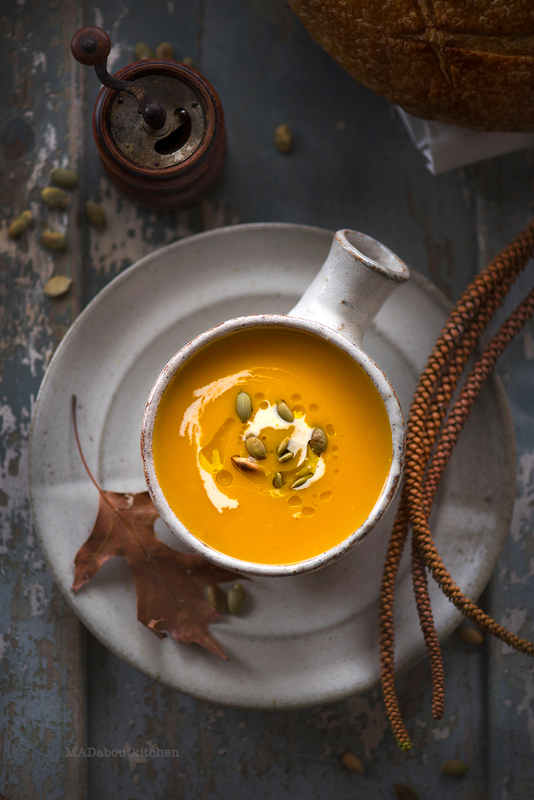 Pumpkin Soup is creamy, thick, smooth and filling. 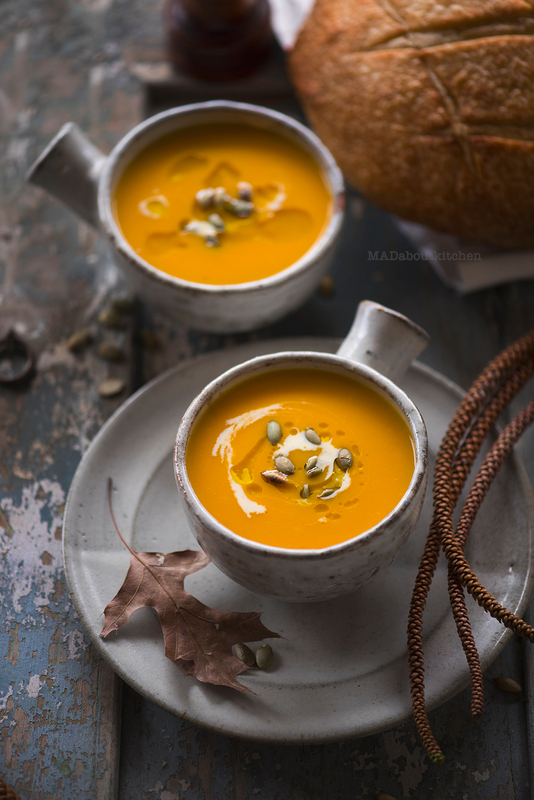 Pumpkin Soup tastes heavenly when had warm with some crusty bread on the side. With Winter approaching soups is all that you need for dinner and I can guarantee you a satisfied meal. And it is a perfect perfect autumn soup. Head a griddle pan and drizzle the oil over it. Add garlic, onion, pumpkin, leeks, rosemary and carrot and saute till the they are cooked. This will take a while. Keep mixing it in between. Add salt and pepper to this. Cook till the vegetables are soft and they start charring at the edges. Let it cool down for a bit. Now blend the mixture into a smooth paste adding very little water. Transfer the mixture into a sauce pan. Add a cup of water and milk and let it heat up. Check for salt and pepper at this stage and add as required. Once the soup is hot, pour them into serving bowls. Drizzle some oil and fresh cream over it and top it with some toasted pumpkin seeds. You may also want to try some interesting soups like Apple soup, Broccoli Almond Soup, Peas and Lettuce Soup. Go ahead and print a copy of this recipe for yourself. umpkin Soup is one of the most common, most basic soups that is made at home. 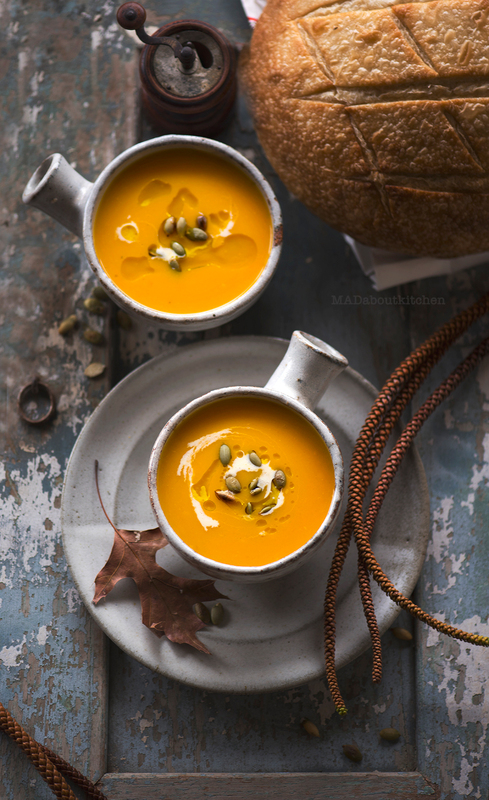 Pumpkin Soup is creamy, thick, smooth and filling.